I am unable to submit a support ticket. When I attempt to login, it spins for a while, then returns to the login page with not error or message. I type my password in each time. Here is may problem. I wouldn't post this issue on a discussion board except I have not other way to get a response. Today, I noticed that my account was charged for the service 3 days later. I would like the charge removed from my account. I am having the same problem. Login support and return to the same login screen. Do you remove all free support totally? No free support? So when i am not getting a service i am paying for, i have to pay to get it fixed and get no apology or rebate for missed service? I seem to have more success logging into http://my.freedompop.com first then scroll down to Help Center box and clicking support there. I'm already logged in and seems to have fewer issues for me going that route. Then I am able to view and review all my previous postings for support. I am unable to submit a support ticket. When I attempt to login, it spins for a while, then returns to the login page with not error or message. I type my password in each time. Here is may problem. There is no choice, but to post on discussion board as there is no other option to get a response. 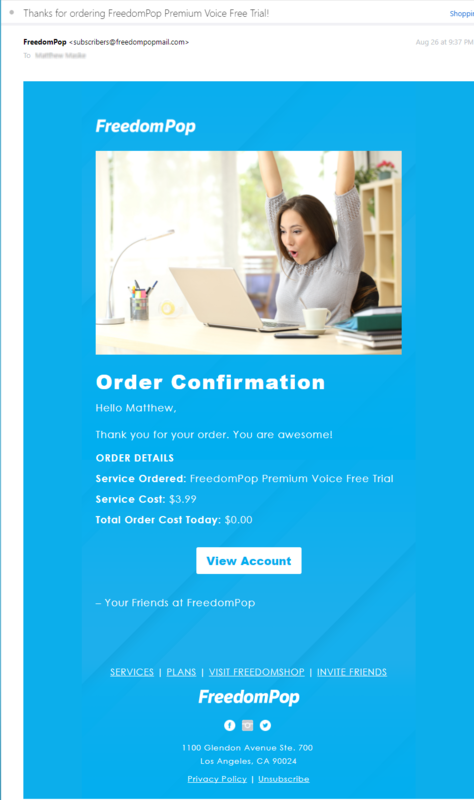 I was offered and accepted a 30 day FreedomPop Premium Voice Free Trial on 12/04/2017. I downgraded before the trial expired and had credit on my account. I noticed that my account was charged for the service 3 days later. I would like the charge removed from my account. MY ACCOUNT IS STILL.FROZEN. I get repeated error message when I try to log on. Can anyone help. Thank you. @Naam1 did you downgrade BOTH plan AND Services back before the 3rd ? Many people miss downgrading the Services when downgrading the plan. That explains a possible why. With your nice approach, an admin may honor your request when one responds. Unless you've been taken care of from another source already. Rich Sias, thanks for your response. Yes I did downgrade BOTH Plan and Service Plan at the same time. This was confirmed at many challenging YES confirmation to both downgrades. Thank again.